﻿Development of multiscale theories, methods, and software for the design and analysis of large scale engineering material systems, materials design, manufacturing, bio-sensing, and drug delivery. PI of multi-year multi-million dollars grants from Goodyear Tire and Rubber Company to develop a virtual lab to enable prediction, synthesis, characterization, and acceleration the synthesis of new polymer nanocomposites with enhanced performance and fulfillment of AAA labeling requirements. Collaborative research is also underway with Bridgestone and Japanese Universities. Technology transfer through DMDII project Elastic Cloud-Based Make: Led by GE, NU is designing training modules for Adaptive Vehicle Make (AVM) toolsets of digital manufacturing technologies developed under the Defense Advanced Research Project Agency’s (DARPA) Adaptive Vehicle Make (AVM) program, such as the instant Foundry Adaptive through Bits (iFAB) tools. The goal is to integrate the most mature elements of the digital manufacturing technologies into an existing commercially available Product Lifecycle Management, Computer-Aided Engineering or Model-Based Engineering software solution, and to apply the resulting new capability to a manufactured product. Technology transfer: Development of new methods and algorithms that have significantly enhanced the accuracy and speed in software for crashworthiness, manufacturing, and prototype simulations. These contributions have been implemented in many commercial and laboratory software: (a) Solid shell elements in DYNA3D, ABAQUS, LS-DYNA, ANSYS, and Argonne National Laboratory (ANL) software; (b) Explicit/implicit methods in US Ballistic Laboratory EPIC-2/EPIC-3 programs, and ANL software; (c) Lagrangian-Eulerian methods adopted by ANL, Kawasaki, Mitsubishi, Ford Motors, and Grumman; (d) Meshfree methods implemented by Sandia National Labs, Lawrence Livermore National Lab, General Motors, Ford Motors, Delphi, Ball Aerospace, Caterpillar, and among many others; (e) Proprietary multiscale methods adopted by Goodyear, Bridgestone for the design of tires and by Sandia. Liu has been developing theoretical and modeling and simulation methodologies that are able to connect multiscale mechanics to microstructural design parameters and for the modeling of microfluidic electrokinetic assembly of bio-molecules and drug delivery. He made fundamental, innovative contributions that have benefitted the understanding and design of additive manufacturing materials, engineering material systems, biological processes, and the use of organic and inorganic materials for drug delivery applications. Liu is elected as the President of IACM, the Chair of USNCTAM within the US National Academies, and a member of the Board of International Scientific Organization within the US National Academies. 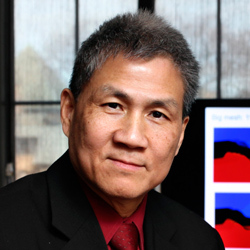 In 2014, Liu is selected as a highly cited researcher in Computer Science and a member of the World’s Most Influential Scientific Minds by Thompson Reuters for the period 2002 through 2012. Liu chaired the ASME AMD and is a past president of USACM. He was the founding Director of the NSF Summer Institute on Nano Mechanics & Materials, Founding Chairman of the ASME NanoEngineering Council, Founding Co-Director of the NU PSED Program and Founding Director of the MS in SdX specialization ME and CEE program. He is the editor of two International Journals and honorary editor of two journals and has been a consultant for more than 20 organizations. Liu has written four books; and he is a Fellow of ASME, ASCE, USACM, AAM, and IACM. Wentao Yan, Wenjun Ge, Jacob Smith, Stephen Lin, Orion L Kafka, Feng Lin, Wing Kam Liu, “Multi-scale Modeling of Electron Beam Melting of Functionally Graded Materials,” Acta Materialia, 2016. Z. Meng, Miguel A. Bessa, Wenjie Xia, Wing Kam Liu, and Sinan Keten, “Predicting the Macroscopic Fracture Energy of Epoxy Resins from Atomistic Molecular Simulations,” Macromolecules, 2016. Z. Liu, MA. Bessa, WK. Liu, “Self-consistent clustering analysis: An efficient multi-scale scheme for inelastic heterogeneous materials,” Comput. Methods Appl. Mech. Engrg. (2016) 319–341. Z. Liu, JA Moore, Wing Kam Liu, “An Extended Micromechanics Method for Probing Interphase Properties in Polymer Nanocomposites,” Journal of the Mechanics and Physics of Solids, 2016. O. Goury, D. Amsallem, SP. Bordas, WK. Liu, P. Kerfriden, “Automatised selection of load paths to construct reduced-order models in computational damage micromechanics: from dissipation-driven random selection to Bayesian optimization,” Comput Mech (2016) 213–234. T. Belytschko, WK Liu, B. Moran, KI. Elkhodary, Nonlinear Finite Elements for Continua and Structures, Wiley, 2nd Ed., 2013, (the most popular text on nonlinear finite element analysis). Y. Li, S. Tang, B. Abberton, M. Kröger, C. Burkhart, B. Jiang, M. WK. Liu, A Predictive Multiscale Computational Framework for Viscoelastic Properties of Linear Polymers. Polymer, 2012. Y. Li, M. Kröger, and W.K. Liu (2012). Nanoparticle Effect on the Dynamics of Polymer Chains and Their Entanglement Network. Physical Review Letters, 109(11), 118001. Xiaoming Bai, Miguel A. Bessa, António R. Melro, Pedro P. Camanho, Licheng Guo, Wing K. Liu, “High-fidelity micro-scale modeling of the thermo-visco-plastic behavior of carbon fiber polymer matrix composites,” Composite Structures, Volume 134, 15 December 2015, Pages 132–14. W. Yan, J. Smith, W. Ge, F. Lin, WK Liu, “Multiscale modeling of electron beam and substrate interaction: a new heat source model,” Computational Mechanics, Vol 56, (2015), 265-276. Vu-Bac, N., Bessa, MA., Rabczuk, T., WK., "A Multiscale Model for the Quasi-Static Thermo-Plastic Behavior of Highly Cross-Linked Glassy Polymers." Macromolecules, (2015): 6713-6723. Brendan C. Abberton, Wing Kam Liu, and Sinan Keten, “Anisotropy of Shear Relaxation in Confined Thin Films of Unentangled Polymer Melts,” Macromolecules, 2015, pp 7631–7639. Y Li, S Tang, M Kröger, WK. Liu. “Molecular simulation guided constitutive modeling on finite strain viscoelasticity of elastomers,” Journal of the Mechanics and Physics of Solids, 2016. J. Smith, W. Xiong, J. Cao, and WK Liu, “Thermodynamically Consistent Microstructure Prediction of Additively Manufactured Materials,” Computational Mechanics, Comput Mech (2016). RP. Tavares, AR. Melro, MA. Bessa, A. Turon, WK. Liu, PP. Camanho, “Mechanics of hybrid polymer composites: analytical and computational study,” Computational Mechanics, 2016. Moore, J. A., Ma, R., Domel, A. G., Liu, W. K., An efficient multiscale model of damping properties for filled elastomers with complex microstructures, Composites Part B: Engineering, 262-370, 2014. Y. Li, M. Kröger, W.K. Liu, “Dynamic structure of unentangled polymer chains in the vicinity of non-attractive nanoparticles,” 2014, Soft Matter, 10, 1723-1737. To learn the basic theory behind the finite element method (FEM); how to program the finite element method using MATLAB as a programming tool; to learn a general commercial FEM code to write interface programs and solve typical engineering problems. The scope of the course is to provide the analytical and computational tools necessary for the design of complex structural and material systems for modern engineering applications, ranging from structural engineering to micro and nanotechnology. Gain theoretical, programming, and application knowledge of nonlinear finite element methods. Understand the associated continuum mechanics and its finite element implementation and applications. Arbitrary Lagrangian Eulerian (ALE) formulations, Non-linear materials, and introduction to computational fracture mechanics; using ABAQUS, programming VUMAT, UMAT. Understand the underlying principles of molecular dynamics. Gain proficiency in designing molecular dynamics simulations using available software (LAMMPS). Understand the connection between information available on small (atomistic) and large (continuum) scales. Applications: Nanostructure materials: Nanowires: single crystal Si. Nano Carbons: nanotube; Polymer nano-composite: polymer mechanics, polymer and polymer-fillers modeling; Multi-scale modeling.